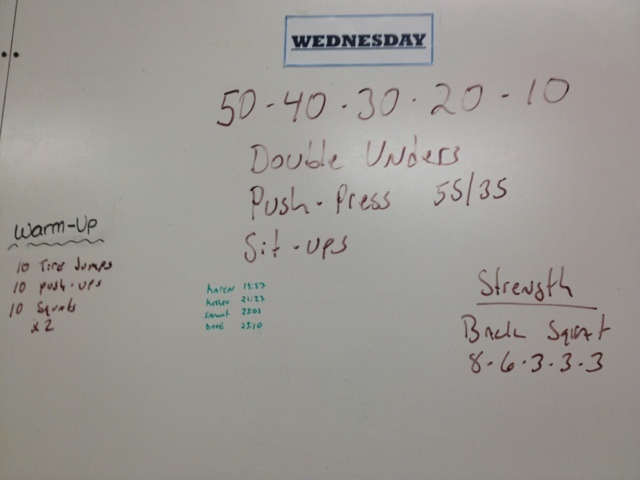 I came back for another WOD, about 12 hours later from the previous one yesterday. I felt pretty good but my back is definitely sore from all those deadlifts! Today was a struggle with double unders. This time, I actually attempted the double under 25 times during the higher rep rounds and then the actual # of reps for the rounds with 20 and 10 reps and although it made me slower, at least I was practicing getting my double unders accomplished! After work, I plan to do the split squats and tall kneeling presses to finish the strength portion of the mountain bike training and then do lactic capacity intervals on my bike trainer.